The Delta-Mendota Canal transports water to cities and water districts in California’s Central Valley, but none to the Del Puerto Water District. Allocations of water to the district were cut to zero the last two years. “We’ve already seen row crops, tomatoes and beans, go by the wayside. We’re running out of water,” said Anthea Hansen, the Del Puerto Water District manager.Click image to enlarge. PATTERSON, Ca. – The signs of California’s mounting drought-related distress are moving west from the Sierras. The state’s mammoth reservoirs are turning into much smaller holding pools. Rivers are thinning into afflicted streams. Colors are being scrubbed from gardens and lawns from Bakersfield to Chico. And here, on the 18,200 hectares (45,000 acres) of cropland and orchards that form the Del Puerto Water District, the leaves of almond trees are curling and turning silver from lack of good water. Almost 5,300 hectares (13,000 acres) of cropland are unplanted. Proposed transfer route of recycled wastewater to Del Puerto Water District. Click image to enlarge. The water district’s leaders have an answer for that – a project to transport nearly 30,000 acre-feet of recycled wastewater from nearby municipal treatment plants in Turlock and Modesto to supply a third of the district’s annual demand. But despite approval by the two cities, the support of the White House, and assurances from a unit of the Interior Department that it will speed a needed change in regulation, there is no certainty that the North Valley Regional Recycled Water Program will be operational by 2018, its proposed start date. By then, if the drought persists, it could be too late for many of the 200 landowners who are in desperate need of water for almond, walnut, cherry, field, and row crops that typically produce more than $US 150 million in annual farm revenue. “We’ve already seen row crops, tomatoes and beans, go by the wayside. 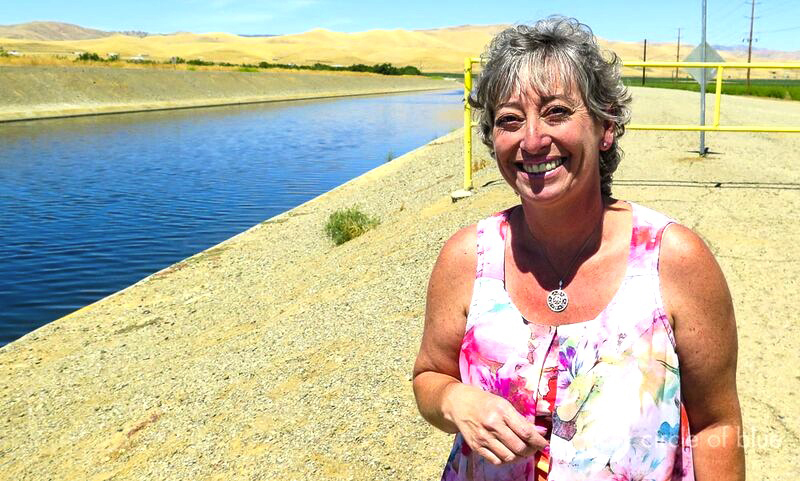 We’re running out of water,” said Anthea Hansen, the Del Puerto Water District manager, in an interview with Circle of Blue. The orchards could be next to go. On average, developing an orchard costs $US 24,752 per hectare ($US 10,000 per acre), according to Hansen, and it can take three to five years before the trees produce. In addition, there are production costs for water, fertilizer, and chemicals. For almonds, this can add up to $US 7,400 per hectare ($US 3,000 per acre). With each hectare producing 2,240 to 3,368 kilograms of almonds (2,000 to 3,000 pounds per acre) and the nuts selling for about $US 6.60 per kilogram ($US 3.00 per pound), farmers can make a profit, Hansen said. Much of the responsibility for securing Del Puerto’s water falls to Hansen, a Central Valley farm girl educated at the University of California at Davis, a married mother of four, and, in partnership with her husband, an orchard owner and grower. She is also one of the few women in the community of western water system executives. Last March Hansen was named the district’s manager following a 16-year career on the Del Puerto staff. Join the conversation with water experts in a series of virtual, interactive town hall events hosted by Circle of Blue and MaestroConference. Explore California’s drought in a global context and learn how the state is charting a path to water security in the 21st century.Click image to enlarge. Hansen’s days now are spent scrambling to keep crops from perishing. The search for available water is a lot like trying to guide airliners through a typhoon. First of all, many Del Puerto growers cannot rely on groundwater for long-term irrigation. The aquifers below the district contain high levels of salts and minerals that weaken trees. So the surface water transported through the Delta-Mendota Canal is the primary source for irrigation. There is big trouble with that. The water in the canal is principally supplied by Shasta Lake, 402 kilometers (250 miles) north and the state’s largest reservoir, which is less than half full. Shasta Lake drains into the Sacramento River and is responsible for keeping the river cold enough for annual fall salmon migrations, and for supplying fresh water to the Sacramento-San Joaquin River Delta. In a wet year, a federal pumping station near Tracy lifts the delta’s fresh water 61 meters (200 feet) into the Delta-Mendota Canal for delivery to Del Puerto’s land, and to more than 385,000 hectares (950,00 acres) that surround and are south of the district. Four years of drought, though, have drained the moisture out of California’s reservoirs and completely disrupted water supplies for farmers, particularly those who rely on the federal canals on the west side of the Central Valley. Earlier this month the State Water Resources Control Board restricted releases of water from Shasta Lake to 205 cubic meters (7,250 cubic feet) per second to ensure that sufficient cold water is available to support the fall salmon migration. Hansen said that releases from Shasta Lake need to reach 226 cubic meters (8,000 cubic feet) per second. That is enough water, she said, to keep the pumping station operating near Tracy. Hansen said she needs those pumps to keep running. That is not because her district can take any allocated water out of the canal. It cannot. The federal government shut off contracted deliveries of water to Del Puerto for two straight years. Anticipating trouble, Hansen purchased 44,000 acre-feet of water to supplement the district’s supply – some of it from rice growers in northern California – at an average price of $US 850 per acre-foot, which equals 1.2 million liters (326,000 gallons). Much of that water flowed down the Sacramento River, through the delta, was pumped at Tracy into the federal canal, and flowed through the district 112 kilometers (70 miles) downstream to be stored in the San Luis Reservoir, California’s fifth largest water storage facility. In a wet year, a federal pumping station near Tracy lifts the delta’s fresh water 61 meters (200 feet) into the Delta-Mendota canal for delivery to Del Puerto’s land, and to more than 385,000 hectares (950,00 acres) south of the district.Click image to enlarge. If the Tracy pumps stop and water in the canal does not flow, that means Hansen cannot exchange the water stored downstream for water flowing through her district. Some $US 25 million worth of water stored in the reservoir for Del Puerto growers gets stranded. A dry Delta-Mendota Canal also means Hansen will not be able to make emergency water deals, agreements that could cost over $US 1,500 per acre-foot today, to secure water from districts and farmers north of Del Puerto. And a dry canal jeopardizes the $US 100 million that the Del Puerto district and several more Central Valley irrigation agencies have already paid this year for water from north of the delta, regardless of whether it can be moved or not. Ever resourceful, Hansen works one problem at a time. She and the leaders of four neighboring districts with water stored in the San Luis reservoir worked on a plan to lease big pumps, install them in three locations, and transport stored water uphill for 112 kilometers (70 miles). Over the last month, the districts secured the necessary permits, and the pumps are now operating. Some 8,000 acre-feet of water have been delivered to Del Puerto growers; 20,000 more acre-feet from the reservoir storage are available through the summer. 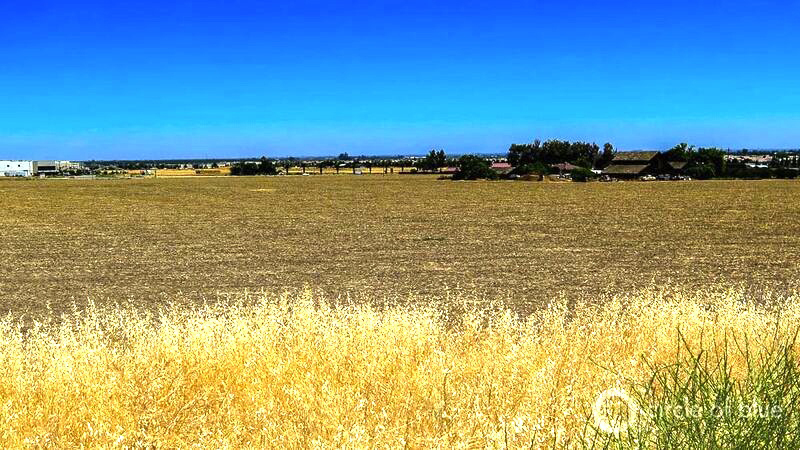 In addition, the district purchased 13,000 acre-feet (at $ US 950 per acre-foot) from groundwater providers in Merced County, some of which is available this year. And Hansen is working on a third plan to buy 10,000 acre-feet (at $US 250 to $US 300 per acre-foot) from the Turlock wastewater treatment plant. In other words, Hansen’s days are a non-stop skirmish to keep orchards alive. Hansen and the water district’s leaders long ago stopped listening for rain and started looking for water. Even before the drought began the Del Puerto district’s leaders began to talk to municipal authorities in nearby Modesto and Turlock about a path to curbing water supply shortages that were becoming endemic. Their idea was to recycle and transport millions of liters from the two cities’ wastewater treatment plants to produce a reliable and affordable supply of fresh water for irrigation. Almost 5,300 hectares (13,000 acres) of cropland are idle due to drought in the Del Puerto Water District, including this tomato field close to Patterson.Click image to enlarge. Del Puerto growers, who harvest a nearly $US 80 million annual crop of almonds alone, are ready to finance the $US 100 million cost of building the pipelines and pumps. They will pay $US 6 million per year—$US 200 per acre-foot—for nearly 30,000 acre-feet of water deliveries annually. The district is pushing hard to start the project, possibly by 2018. The innovative Del Puerto recycling plan, one of the first big agricultural wastewater recycling programs in the country, gained support from both cities. Turlock spent $US 35 million in 2004 to upgrade its wastewater treatment plant to meet tougher federal and state discharge requirements. The city sends a small portion of its recycled wastewater to an energy cooling center and a local park, with the rest discharged into the nearby San Joaquin River. Modesto is nearing completion of a $US 130 million project to clean its wastewater to near drinking water standards and is capable of producing 16,500 acre-feet of water for the Del Puerto Water District. 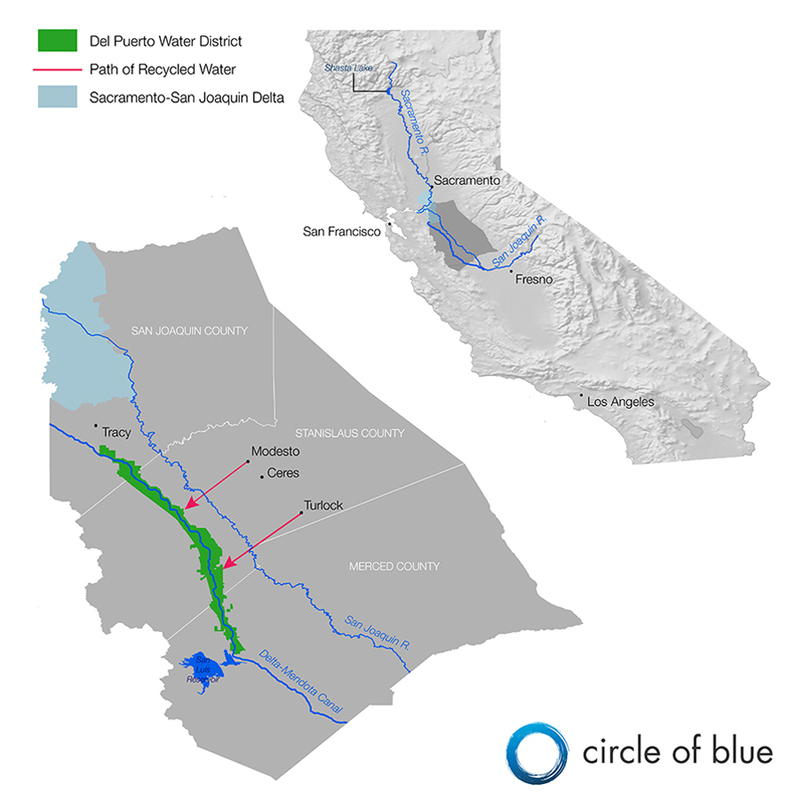 The rest of the North Valley Regional Water Recycling Program involves building 10-kilomter (six-mile) long pipelines from the two treatment plants to discharge recycled water into the Delta-Mendota Canal, where it will flow to Del Puerto growers. The U.S. Bureau of Reclamation, a unit of the Interior Department that owns the Delta-Mendota canal, is set to allow wastewater to be directly discharged into a federal facility, something that is currently prohibited. The Del Puerto recycled water project reflects the urgency to respond to changing ecological conditions in California, and the state’s new comfort with viewing wastewater as a resource not to waste. All across California, the drought is reshaping popular views and prompting intelligent water recycling projects. It wasn’t too long ago that treated wastewater was widely derided in California as “toilet water” to be immediately discarded. Last year, though, California established an $US 800 million low-interest loan program to develop water recycling projects, a source of revenue that Hansen and her colleagues plan to tap to help build the Del Puerto project. “It’s a lifesaver if we can get it going. It will help people like myself and my neighbors who need water. 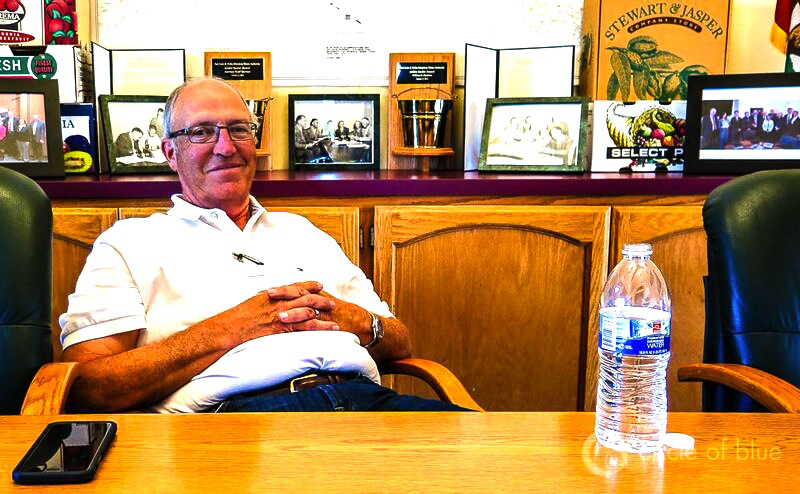 It’s a reliable supply of water, which is something we really need here,” said Jim Jasper, the owner of Stewart & Jasper Orchards, an important producer and processor of almonds, about the plan to irrigate with recycled wastewater.Click image to enlarge. Orange County proved the value of recycling wastewater to recharge its drinking water aquifers. Monterey County recycles wastewater for agricultural irrigation. San Diego last year approved the construction of a $US 3.5 billion wastewater recycling project to supply a third of the city’s drinking water demand and to save wastewater treatment and disposal costs. How long it takes for treated wastewater to reach Del Puerto growers is uncertain. The Turlock Irrigation District opposes the Del Puerto project. District leaders are nervous about the effect of the project on their groundwater supplies. 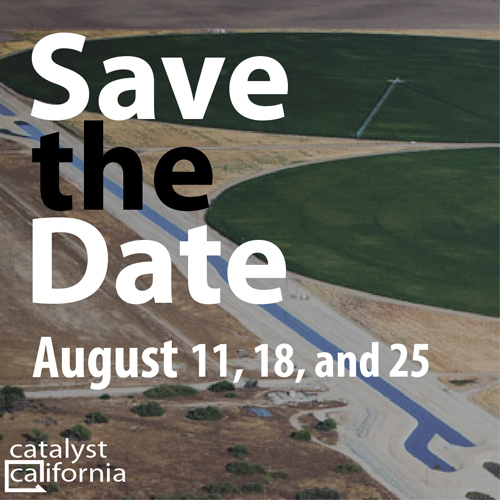 And the Westlands Water District, the largest irrigation district in the country, is challenging the project because of what it says could be harmful effects to the San Joaquin River from losing thousands of acre-feet of wastewater discharges to the river. Responding to both formal complaints involves hearings and negotiating sessions that could take two years to resolve. What the drought is teaching Del Puerto growers, and all Californians, is that the 20th century principle of dominating nature to assure economic security is being replaced by the plain fact in the 21st century that nature is fully capable of dominating us. Del Puerto district leaders understand what they face and are establishing new water supply practices to abide in what is shaping up to be a century of ecological tumult. Castroville Saltwater Intrusion Project (CSIP) in Monterey County takes waste water from the Monterey peninsula cities and the city of Salinas treats it at a wastewater plant in Marina. 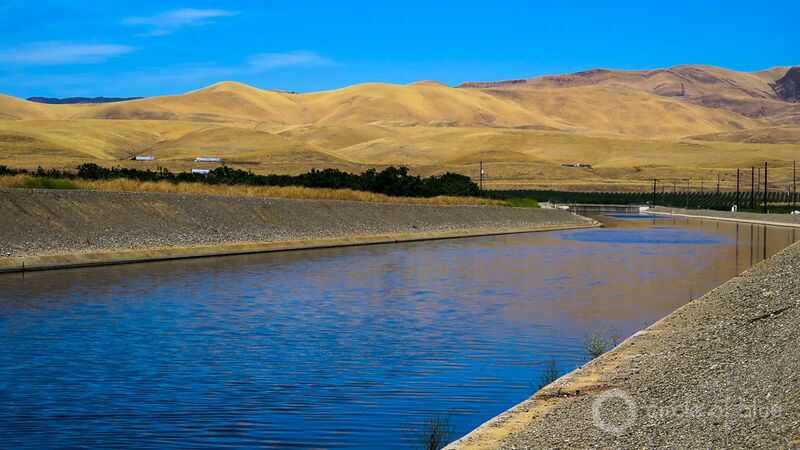 The water is distributed to 12,000 acres growing the finest and safest fruits and vegetables in the world. the project was paid for by the land owners in the project area. We are into our 18th year of use. Water recycling, it’s a great solution people! I want to see California adopt mandates for water recycling systems or at least provide bigger and better rebates for installing a greywater system in the house… I also hope California can update its plumbing codes to make it easier to install a grey water recycling system. I’m definitely jumping on this grey water craze, I mean who wouldn’t? You save water, you save the environment and (best of all) you save money. It’s a lot more affordable than the other greywater systems out there… Also I like how the maintenance is simple so even a newbie like me can diagnose and fix a problem. Anyone else have any experience with another greywater system out there?